Big and small dogs will be bounding through the snowdrifts without a care in the world in this warm, waterproof jacket. This dog winter jacket is sure to be very warm and cozy. It has a snap closure and is multicolor schemed with a detachable hood and comes ready with a leash hole. The outer shell is waterproof and the interior is a warm cotton polyester blend. 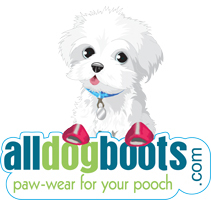 This dog coat is ideal for the tiniest to the largest of dog breeds. The coat is well made and warm enough for the below zero winter we are experiencing. 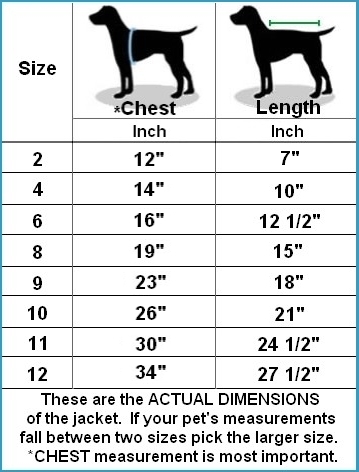 My dog is small (5 lb) I measured carefully but the coat is a little smaller than I would like. If I was doing it again I would add an inch to the chest to ensure a good fit. It also could be 2-3 inches longer. Overall I think this is a well made coat. Hasn't had a chance to use coat yet. Maybe tomorrow. We're supposed to get snow!! This jacket is so cute on my little Chihuahua. He's 5 1/2 Lb and the size XS is perfect on him. The colors are attractive, too.I like the hoodie because it is Not too tight on those big Chihuahua ears, but will protect them without harming them. I also like the fact that the hood can be removed and worn with a black sweater. It's a nice warm jacket. My dog loves his jacket, now he is so happy playing in the snow. the jacket fits him very nicely and he wore it saturday morning on are walk.